Childage: 4-10 yrs. Children 3 and under are free. 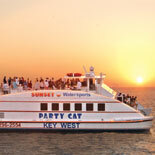 Join the fun aboard Key West's #1 attraction. The Do-It-All Watersports Adventure lasts from 10 a.m. to 4 p.m. This six-hour U.S. Coast Guard-licensed adventure provides the opportunity to participate in 11 exciting water sports for one affordable price with safety in mind. Snorkel in the pristine tropical waters and explore a shallow water wreck. Ride the latest personal watercraft, water ski, kneeboard and enjoy an exhilarating banana boat ride. Enjoy kayaking, windsurfing and piloting a Sunfish Sailboat. Climb the rock face of the 20-foot-tall 'Iceberg' and slide down the other side into the temperate Gulf water. There is also a mini-slide incorporated into the hull of the boat. The adventure includes a complimentary BBQ lunch, veggie tray and soft drinks as well as draft beer on the journey back to shore. Enjoy Snorkeling in the pristine Gulf waters around a shallow water ship wreck. 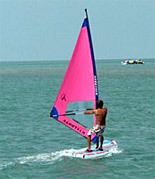 Windsurf, Kayak and sail the Sunfish Sailboat. 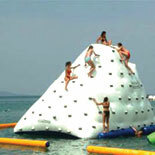 Climb the floating 20 ft high Rock Wall "Iceberg"; and slide down the other side back into the water. For small children and the young at heart, there is a mini slide built right into the boat! U.S. Coast Guard licensed. Safety is practiced as well as fun. Free BBQ lunch, veggie tray, and soft drinks. Free draft beer served on the way back to shore. Do-It-All Watersports Adventure departs from Key West's historic Seaport Bay. Once you reach the pristine water near Wisteria Island, you can choose from a variety of exciting activities on a rotating basis. Along with water skiing, kneeboarding, banana boat rides, the selection includes snorkeling, windsurfing, kayaking and thrilling wave runner rides. You can climb to the top of the 20-foot-high 'Iceberg' and then slide back into the sea as well as enjoying the mini-slide built into the boat. For maximum safety while having fun in the sun, thorough instructions are provided for all activities. The boat captains are fully licensed by the U.S. Coast Guard. The complimentary lunch includes BBQ pork sandwiches, chicken nuggets, hot dogs and French fries as well as vegetable trays and soft drinks. The climate-controlled cabin with its large plasma screen TV is the perfect spot to take a break or you can relax in the warm Key West sunshine on a raft or the open-air sundeck. Free draft beer is available during the return trip to the pier. Climb on board this action-packed boat for one low price. Obtain an eTicket today to reserve a spot on the next Do-It-All Watersports Adventure, which will be the highlight and #1 attraction of your trip to the Conch Republic. Get on the Party Boat! Operates daily. Boarding: 9:30 am ~ Boat departs: 10:00 am ~ Returns: 4:00 pm. During Power Boat race week (11/6, 11/8, and 11/10) Boat departs 9:00 am to 3:30 pm. Please check in 30 minutes prior to departure. There is a public parking lot at Caroline St and William St. and limited metered parking on the streets. 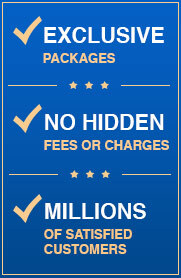 Reservations are required at least 3 days in advance of desired tour date. Remember your sunglasses to guard against the glare off the water! And a hat to protect against the sun, plenty of sunscreen (non-oily), a towel and of course your camera! 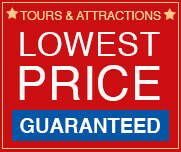 Blow out Special rate including Parasail and Sunset Cruise not available on Major Holidays.